For as long as I can remember, Detroit basketball has been tough and take-no-prisoners, symbolic of the city itself. “We are a blue-collar city. It reflects in our game, in the way we play,” said Hall of Famer Spencer Haywood of the city where he grew up. “We need more than three hours” to talk about Detroit basketball, said city native and former NBAer Steve Smith. Before they left town in the late 1970s, downtown’s Cobo Hall was where I and my generation saw the Detroit Pistons play NBA games. All city buses went downtown, and with a school ID and a buck, we had good seats. They were good games, not like today’s carnival-like, commercial-filled contests. “Cobo Hall was Detroit basketball,” echoed Yahoo! Sports NBA Writer Vincent Goodwill, a native Detroiter. However, the Pistons’ late owner’s public declaration that his reason to move the team out of the city — a team largely supported by a Black fan base — was because he wanted a new fan base (call it White), was a collective slap to us. 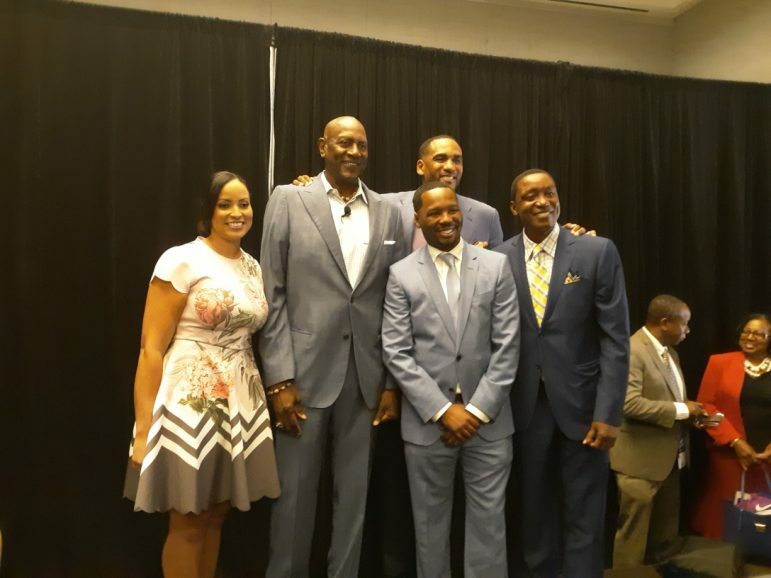 “There was some emotion” over the team leaving town, said Stephanie Ready, who moderated the Detroit sports panel that Haywood, Smith, Goodwill, and Thomas all appeared on at this year’s National Association of Black Journalists (NABJ) conference. It was Dave Bing, who later was elected mayor, and Bob Lanier — two of the league’s greatest players — who led Detroit during its out-of-playoff years. Then came Isiah Thomas, the Pistons’ top choice, and second overall, in the 1981 NBA Draft. “I came to Detroit in 1981, originally from the west side of Chicago,” said Thomas stressed. He soon was embraced by the city, as we adopted him as our own. “This is home,” he said of Detroit. Unlike today’s NBA players, who often show their impatience about waiting for a nucleus to form, Thomas played his entire 12-year pro career in a Pistons uniform through bad years and good. “When the city was struggling, he brought life to the city,” Haywood said of Thomas, a Hall of Famer who was also named as one of the NBA’s 50 greatest players. Haywood suggested that a statue be erected for Thomas in front of the new downtown Detroit arena. The Pistons road to greatness began in 1983 and cumulated with four consecutive NBA Finals appearances and back-to-back titles in 1989 and 1990. But, instead of being lauded as other champions, they were mainly known as the “Bad Boys,” a team everyone outside of Detroit loved to hate. “We were being described by the White [media],” Thomas remembered. “We talked about being mentally tough. We didn’t have the talent to play with the Lakers, but we could game plan, scheme and strategize. That won us basketball games. Still, it was hard to call them “Detroit” since they played 60-75 miles away from the city, first in Pontiac, then in Auburn Hills. “You can’t talk about basketball without talking about [Detroit],” Thomas concluded. Next: How the Pistons changed the NBA but were not given credit, and how Detroit got blamed for one of the NBA’s ugliest episodes.